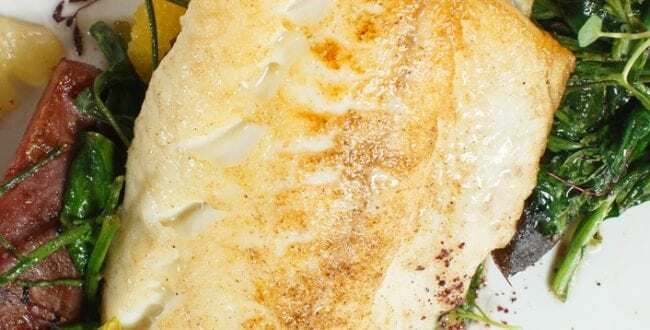 Begin by preparing your Halibut fillets, making sure each is nice and evenly portioned, any excess fat is removed along with ensuring no bones are left behind. Begin the seashore salad by cooking the potatoes in separate pots as they will both have different cooking times. Cook the potatoes through, strain them and set them aside to cool. Once cooled, slice them lengthways or at least in a nice chunky wedge, set them aside once again ready to go through the salad. Now heat a wide based pan and add some olive oil along with about 20g of butter. Once melted add the potatoes and allow the temperature to come up slowly. Once the potatoes have warmed add the samphire to the pan for a minute or so before then adding the leaves. Turn this gently over a moderate heat until all the leaves have wilted. Now add the segments to the pan and turn very gently so as only to warm and not break up the segments. Keep this warm ready to serve. In a separate pan heat with a little olive oil, now season the halibut only on the flesh side so as to keep the skin crispy. Place the fillets in the pan giving a little shake for the first minute to avoid the fish sticking. Cook for about 3 minutes before turning. Now add the butter to the pan and cook for a further 2 minutes before squeezing a good amount of lemon juice over. To serve, drag a mix of the salad and potatoes down the centre of the plate ensuring you place a couple of well-positioned segments for colour around the plate. Now place the halibut in the centre and sprinkle a little sumac across the top.